Our safe and nurturing environment is at the heart of all we do. Happy children, caring teachers, engaging program, exceptional facilities all combine to create an extraordinary place for young children to learn and grow. Our beautiful campus has an art room, exploration patio, large ventilated classrooms, music and movement room, developmentally appropriate outdoor and indoor play spaces, resource room, reading area; dolls play area, play ground, water play area, smart boards, open spaces and an abundance of trees and flowers. The campus is fully enclosed and secure. 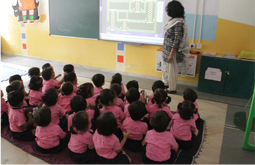 It's an ideal, warm environment, for early learning and growth. 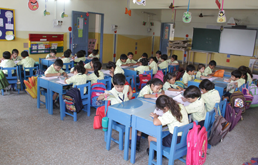 The classrooms are well lighted and provide ample space for exploration and learning. 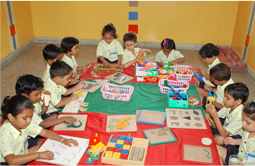 Areas for whole group circle time, cooperative games, role play, individual table activities, and teacher directed small group sessions, skill based learning centre and project areas are all part of the classrooms. We also have a kitchen, and a sick room. Educators at New Era are qualified, dedicated professional educators. They care about children, value education, and have concrete knowledge of developmentally appropriate practices and early childhood development. All teachers have a passion for working with young children. selected teachers go through an intensive training programme to understand our teaching philosophy and to be kept updated with the latest trends in teaching and early childhood development. All experiences are strategically embedded into the day to immerse children in meaningful learning and enhance their understanding of a wide range of concepts in a developmentally appropriate environment. The daily schedule balances time inside and outside the classroom as well as experiences in our specialty areas. Quiet areas for small group and teacher-directed learning. 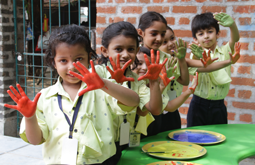 At New Era, concepts are taught through activities, songs, and games, and a variety of hands on experience through which the child can explore and learn about the world around them. 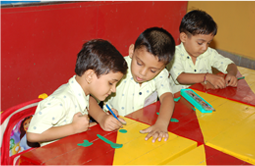 Mixing colours, scribbling across a blackboard, painting and shaping objects is a great way to teach new way of thinking, creating and communicating with images as well as words. Children are actively involved in multitude of activities like running, jumping, hopping, balancing, catching, throwing, ascending and descending steps, cutting, colouring, clay modeling, beading, and lacing. Experiences not only provide enjoyment but it also nurtures the overall development of the child. Listening, speaking, reading and writing is the foundation of all learning. 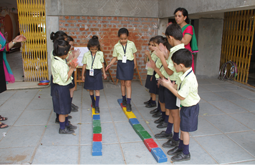 We provide a range of exciting activities to help children acquire these skills. Since children learn best through direct experiences, we organize outdoor fieldtrips like visit to the fire station, zoo, supermarket, aquarium and parks for our young explorers. 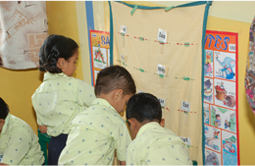 Through an array of teaching aids, you will see children exploring, manipulating, which in turns develops their observation, matching, classification, sequencing, discrimination, thinking, counting, problem solving, identifying the similarities and differences, speaking, questioning and reasoning. 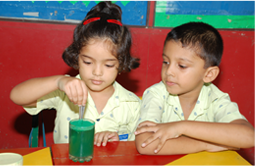 Instills a sense of curiosity and an inquiring mind which enables children to explore the world and surroundings. Please notify the staff if your child is going to be absent for any reason. If the child is absent due to illness or any other reason for more than 3 days, parents are requested to inform or notify us in writing. 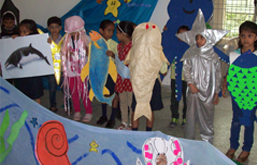 Parental participation in the school is very important to us. Parent visits and feedback are important and welcome at all times. Speaking to the adult/teacher at the time of dropping or while picking up your child or during school hours is not permitted. You must call the office and make prior appointment to meet the respective teacher at both your convenience. Change in telephone numbers or address should be reported to the office immediately. Your child's safely in the event of an emergency could depend on the accuracy of this information. Anything requiring our immediate attention has to be notified to the office. Please check the child's bag for circulars. We celebrate kids birthday in our unique style. 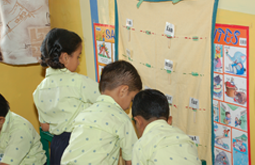 The child can bring toys, books ,educational aids that will be kept in the childs class. Any kinds of gifts to fellow child/teacher are strictly not permitted. Chocolates are not allowed. Dairy is given to the child primarily to make the communication easy for both parent and teacher. Please read and sign regularly. Every weekend the diary will have some simple activity for the child. We believe that children need healthy food for their growth and development; hence snacks that are nutritional are provided from school. With regard to personal belonging of the child the school will not be responsible for any property lost. To avoid such losses make sure that everything that the child carries are properly labeled. Field trips will be scheduled on specific days. You will be notified well in advance. In case of illness please do not send your child.